The most incredible footage you will see today. I promise. In all the superhero hype and the clutter of the news feed, I completely missed this. 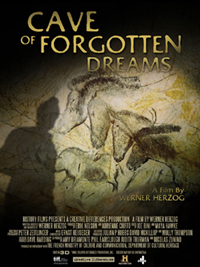 Werner Herzog’s 3D documentary, Cave of Forgotten Dreams, has a trailer. I almost didn’t want to watch it, though. I want to see this on the big screen and in 3D. There’s no way a trailer can capture this even in the slightest, can it? No. But whether 3D or 2D, the subject of this documentary is irresistible. No one can get into the Chauvet caves, and we have only a handful of images to experience the haunting depth and brilliance of the find there. And though the trailer isn’t very good, the tiny glimpse of the art was enough to make me actually gasp. Stunning. Just phenomenal. This is as good a version as I could find (thanks /film) and the audio dies out about halfway through. I actually thought that was intentional (there’s a bit of dialogue about “now we enjoy the silence of the cave”), and it might as well be, because it works. I can’t wait to see this, even if I have to see it in 2D. (How many of us have art house theaters equipped for 3D? I suspect mine isn’t.) There’s still no US release date, but the UK is reportedly getting it on March 25.